Blogging is a profession and a passion that has been transformational. The feedback has changed and informed me. I have written, travelled, presented and networked. It has allowed me to learn and to communicate with a global audience that has been enlightening, inspiring and empowering. It asks questions of you. Will people appreciate your thoughts and views? Will I be seen as funny, clever or just an impostor and interloper? It is a place for courageous people and those who have a thirst for learning. Blogging exposes you to a world wide audience that sees all your ideas, thoughts, spelling and grammar mistakes. The term the “Naked Blogger” has a certain truth. Brian Appleyard of the “London Times” says this about blogging. 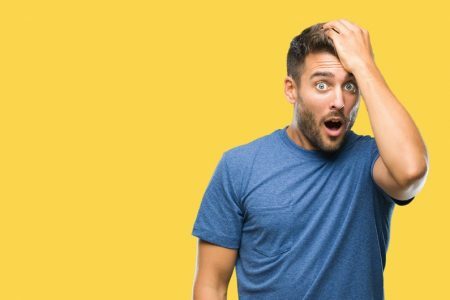 “The blogscape is not for the faint-hearted….There’s a shocking disconnect between one fact — you sitting at your computer — and the next — what you just wrote being instantly visible to the entire world. Try to think of it as like stepping out of the toilet to find yourself standing on the centre spot at Wembley on cup-final day”. But don’t let that image stop you blogging! I have met the most awesome people that have reminded me of how connected we are and how lucky we are to live in a time of technology that provides us with boundless opportunities. What have I Learned about Blogging in 2011? It continues to surprise me as the social web continues to transform society and culture. So what some key observations for me in 2011? 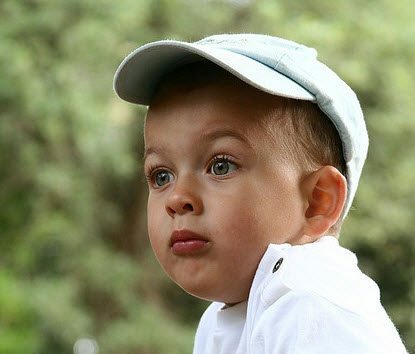 What have you learned about blogging in 2011? Technorati is known within blogging circles as the “Bible of Blogging” and once a year it surveys the blogosphere to find out what directions and trends that are influencing bloggers and the state of blogging. Here are some key findings that I thought were worth sharing. 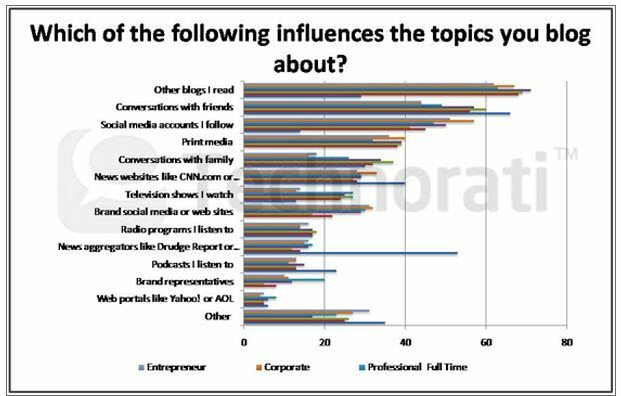 The blogosphere is influencing itself – respondents say that the number one influence on the topics they blog about are other blogs they read, a huge jump from 2010. 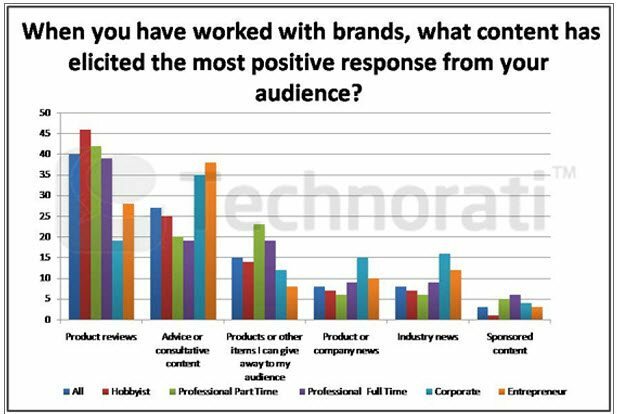 2.What Content when Blogging about a Brand Produce the Most Positive Response? Among Hobbyists and Professionals working with brands, product reviews have elicited the most positive response. Among Corporate and Entrepreneur bloggers, the best response has come from advice or consultative content. Bloggers are being actively courted. 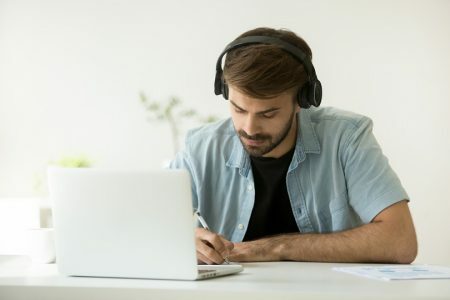 Nearly four out of 10 overall, 59% of Professional Part Timers, and 66% of Professional Full Timers have been approached to write about or review products. Pros are approached eight times per week on average. 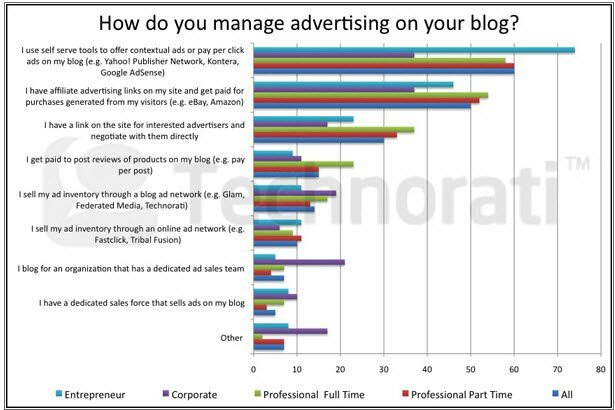 The most frequently approached Hobbyist, Professional Part Time, Professional Full Time, and Entrepreneur bloggers report being approached more than 200 times per week. 4. Is Blogging Being Taken More Seriously? 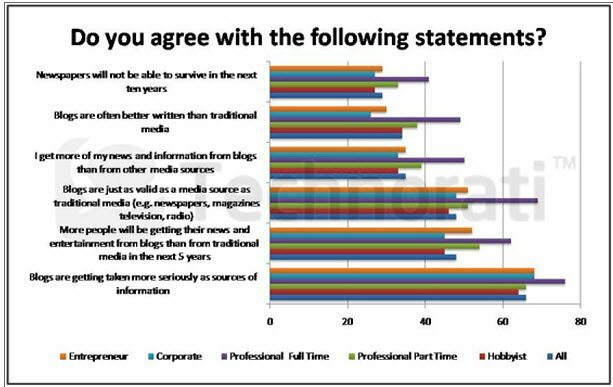 More than two thirds believe their blogs are getting taken more seriously as sources of information, with 76% of Professional Full Timers agreeing. 14% of bloggers spend at least 21 hours per week visiting social media sites. About two thirds spend less than an hour watching TV shows on their computer, tablet or smartphone or uploading photos to photo-sharing sites. This is the second year we surveyed consumers on their trust of and attitudes toward the media they consume. 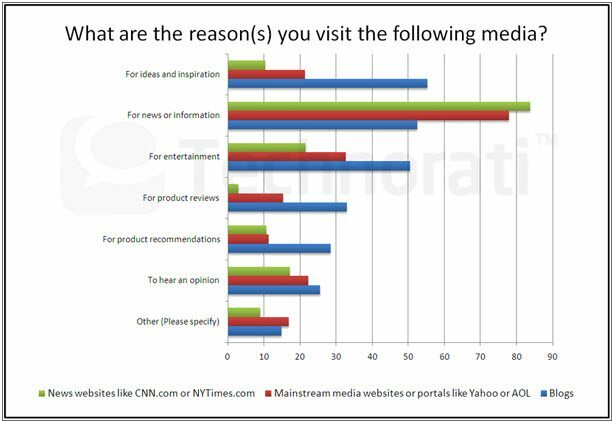 Compared with other media, blogs continue to outpace other social media and many traditional media in terms of trust and generating consumer recommendations and purchases. Facebook remains somewhat influential, but less so than blogs, and Twitter has seen a drop in influence over the past year. 7. Why Do Bloggers Blog? 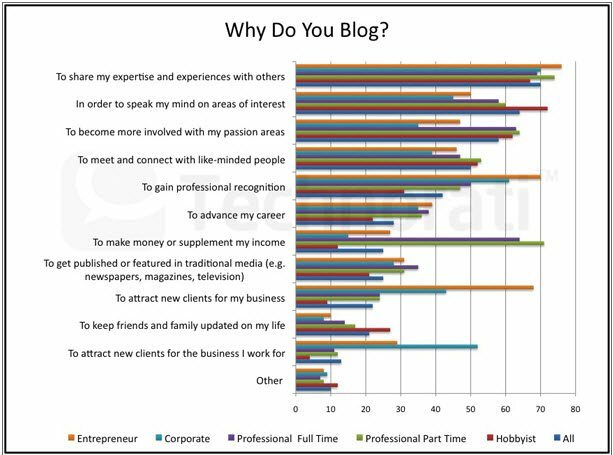 70% of all bloggers use their blog to share their expertise and experience with others. Professionals also use their blog as a way to make money or supplement their income. 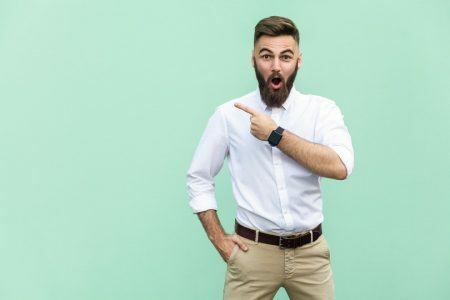 Corporate and Entrepreneur bloggers are looking to gain professional recognition, while also using their blog as a way to attract new clients to their business. 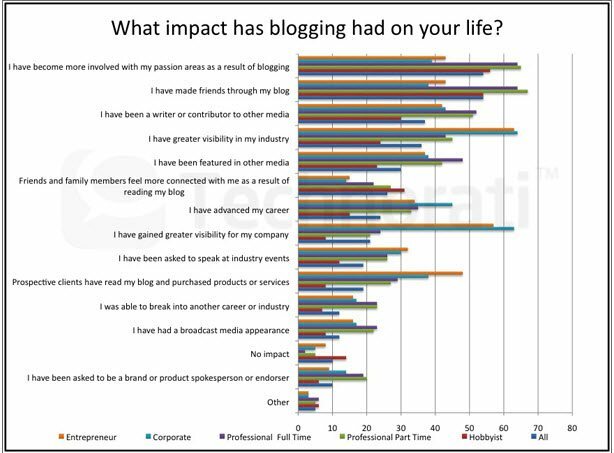 Overall, respondents seem to feel that blogging has had a positive impact on their personal life. 54% of respondents agree that they have made friends through their blog, and the same number agree that they have become more involved with their passion areas as a result of blogging. 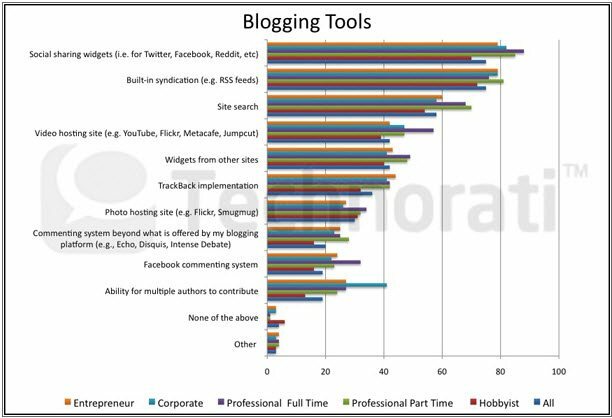 More than 60% of Corporate and Entrepreneur bloggers have gained greater visibility in their industry through blogging. 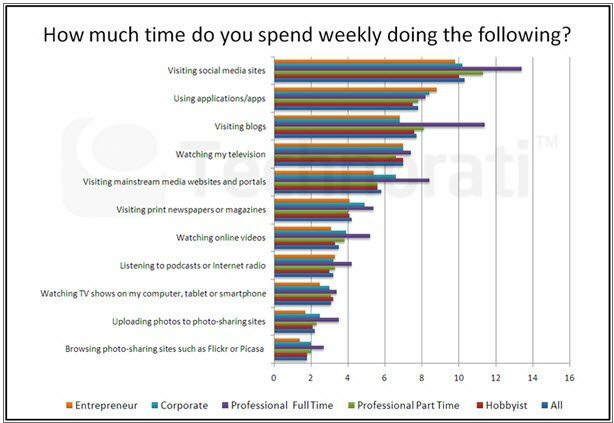 82% of bloggers surveyed are using Twitter, with almost all Professional Full Timers (93%) and Professional Part Timers (91%) using Twitter and having on average over 1,000 followers. Those who use Twitter say they do so to promote their blog (77%), follow friends (60%), and bring interesting links to light (59%). 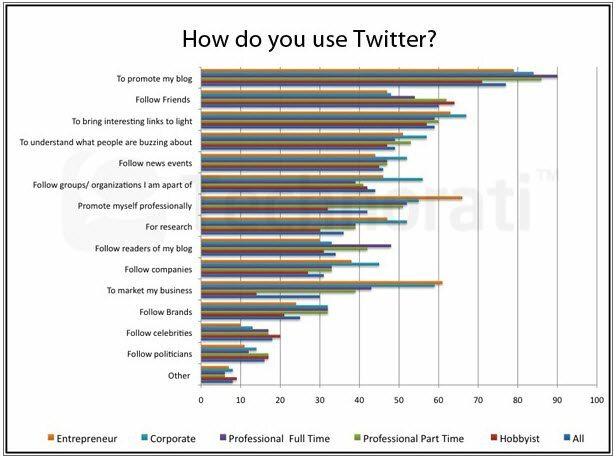 Professional, Corporate, and Entrepreneur bloggers use Twitter to promote themselves professionally. 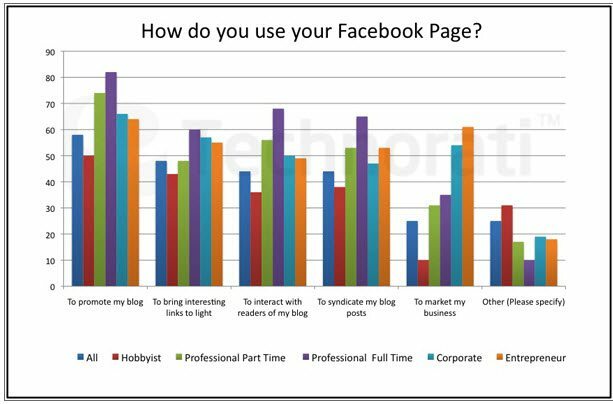 Almost nine out of ten bloggers surveyed (89%) use Facebook. 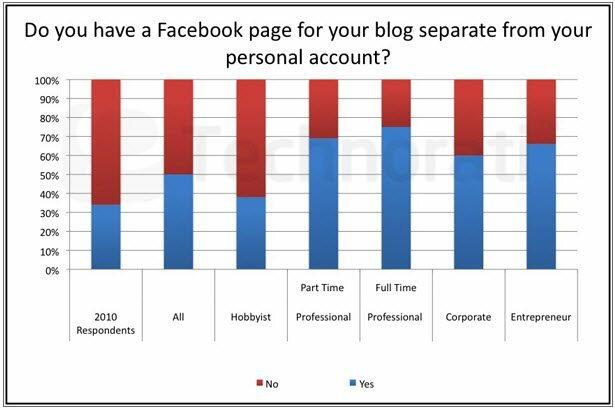 50% of all bloggers have separate Facebook pages for their blog and for their personal account, a jump from only 34% last year. Among respondents who have only a personal Facebook page, 60% are not linking their page to their blog in any way. 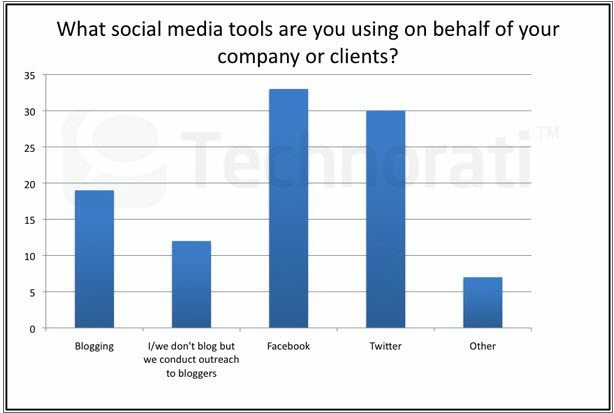 Among Facebook users, the most common reason for using the social network is to promote one’s blog. 61% of Entrepreneur bloggers use Facebook to promote their business. 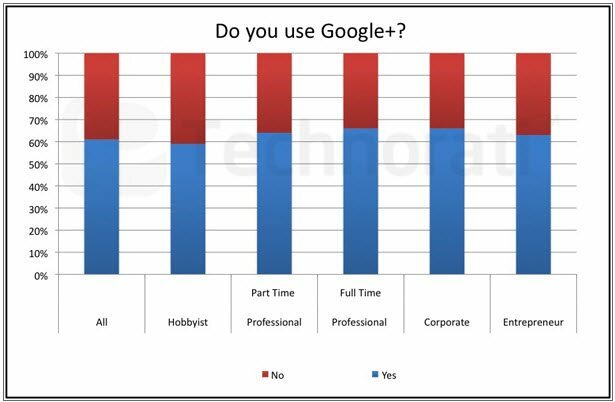 More than six out of ten respondents use Google+. Of those who use this service only 13% have a separate account for their blog and personal use. Other than Facebook and Twitter, the most popular social networking platforms among respondents are LinkedIn and YouTube. 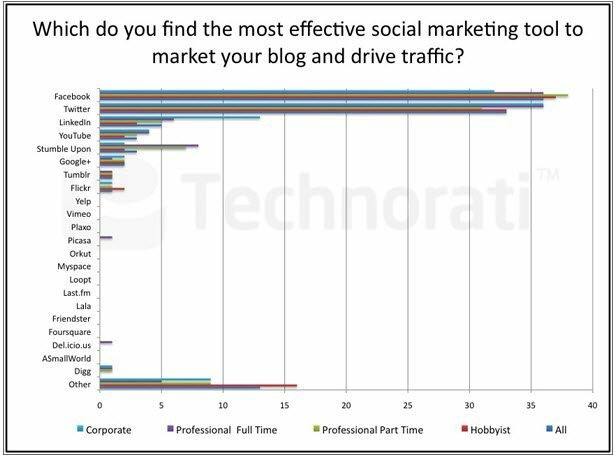 Not surprisingly, respondents found Facebook and Twitter to be the most effective social networking tools to market their blogs and drive traffic. 12. 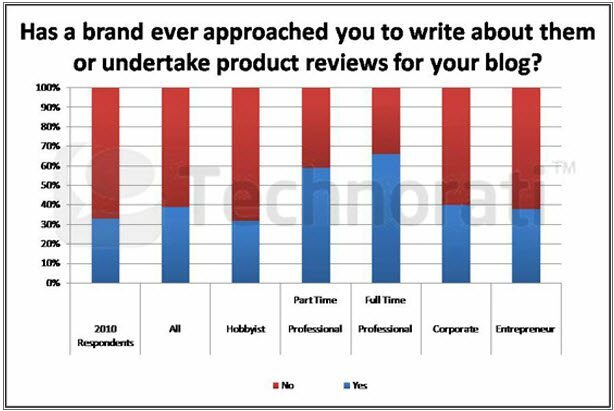 What do the Marketers Say about Blogging? Some quotes from the marketers. WordPress is the most popular blog hosting service among all respondents, used by 51%. Blogger and Blogspot hosting services are also popular (21% and 14%). 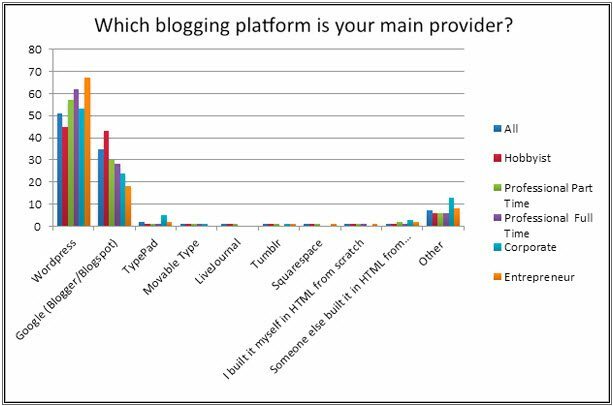 Particular blogging tools are very widespread among bloggers, especially built-in syndication (75%) and social sharing widgets (75%), as well as site search (58%). Among bloggers who use built-in syndication, the majority (76%) support full content. 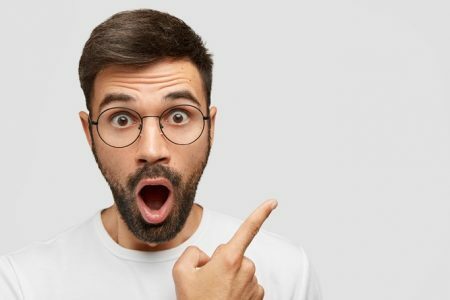 Among those who do not have advertising on their blogs, 52% say they do not have advertising because they don’t want their blogs to be cluttered with ads, while 38% said they don’t have enough visitors to make it worthwhile. Another 36% are not interested in making money on their blog. Among those with advertising on their blog, 60% use self-serve tools, while 50% have affiliate advertising links on their site. 17. How Do Bloggers make Their Money? 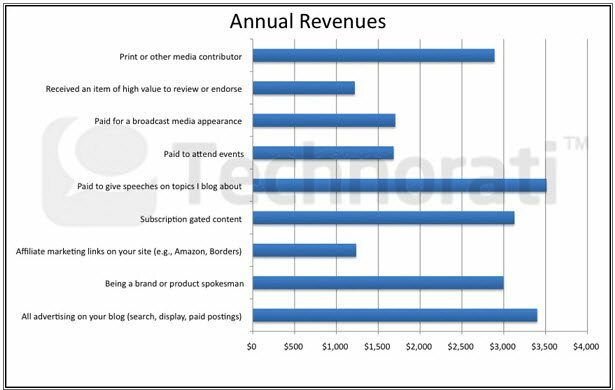 Most blog-related revenue is generated through giving speeches on blogging topics and advertising. 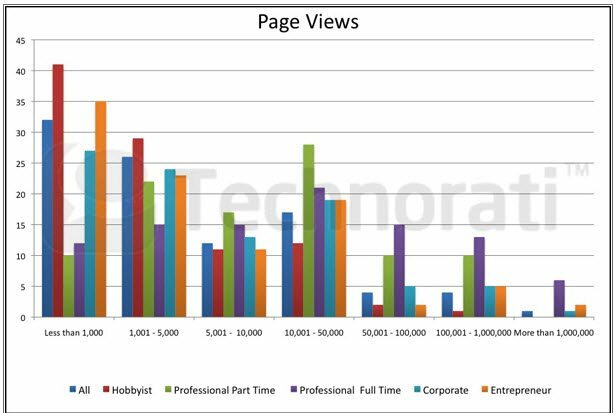 Professional bloggers receive the most views, with over half of the blogs viewed more than 10,000 times per month. What do think about the survey? Does anything surprise you?